With so much riding on the future of your business, you constantly search for indications of shifts in market dynamics. IronMonthly can help. Its compilation of a rolling 12-month set of retail transaction data points helps pinpoint those changes. It focuses on the most common machinery types and classes, including tractors, combines and high clearance sprayers and shows trends back to 2005. 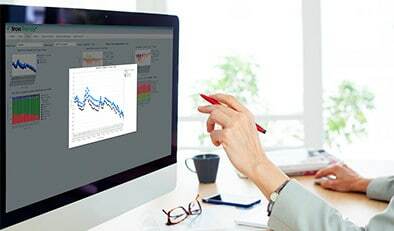 Lenders can use IronMonthly to evaluate portfolio risk based on pricing trends. Dealers identify changes in specific equipment demand as evidenced by price movements. And Analysts use it as a tool to identify changes in market dynamics to help identify potential opportunities. Currently, IronMonthly is only available with US market data and for agricultural equipment only. Instant Visibility: IronMonthly provides at-a-glance clarity of the direction in which used ag equipment prices are moving. Type/Class Detail: With 42 Type/Class combinations, IronMonthly lets you drill down to the level of information most valuable to you. Retail-level Values: Only IronMonthly uses dealer sold transactions to calculate month-to-month valuation changes. Trusted Data Your Way:IronMonthly is delivered monthly in a flat file for easy implementation into your own systems and processes. IronTrends, a web-based application, lets users study shifts in equipment values by machine type, make, model, and geography from 2007 until today. It tracks how a type, make, class or model has performed over time versus the IronIndex. Easy-to-understand graphs aid visualization of these changes and provide granular insight into competitive shifts over time, a view that isn’t available anywhere else.